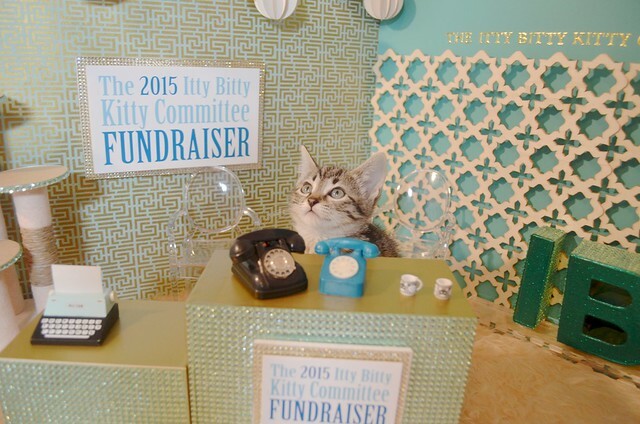 The Itty Bitty Kitty Committee: The Final Four! This FUNdraiser is just flying by! It feels like we just kicked it off and here we are with just four days left! As it stands, we're just a hair below $83,000 so we've got $42,000 to raise. It feels like a lot, but I'm confident we can get there if we continue to meet all of our matching donation challenges (and then some). So please, stay with me friends! Together, we will get there! And to help us get us a few squillions closer, we've got a super duper awesome matching donation challenge! Our Anonymous Lover of Kittens has offered up this great match. For every dollar we donate, she will be donating TWO, until we reach the $2500 cap, or until 7:00 PM Pacific Time, which ever comes first. So that $2500 we bring in (assuming we meet this match and we will!!!) will magically turn into $7500!! To get your dollars TRIPLED, please visit our Firstgiving Page and make a tax-deductible donation. Thank you so much Anonymous Lover of Kittens. This wonderful match is going to take us one big step closer to reaching our goal! Thank you to all who have helped come so far with this fundraiser. Whether you made a donation, left supportive comments, cheered us on, prayed or sent good vibes our way, or helped us by spreading the word to your kitty-loving friends - we appreciate it all. This community of ours is so amazing. Even though I've witnessed your kindness and generosity for many fundraising seasons now, the amount you care and give still shocks me. I love your huge hearts. I've said this before, and I'll say it again, I hope you know how special you are. $1 = $3!! Who doesn't love that math?!?!?!? Thanks, Anonymous Donor. You ROCK TRIPLE TIME!! Whoever this anonymous donor is, they really are amazing! I live on the opposite coast, and money is tight these days but I had to give something today, knowing that even my little donation will be tripled. If only every Humane Society were this loved and supported! !